My brain keeps repeating, 'brilliant, brilliant, brilliant,' over and over and over again, almost in a cadence. I could hardly stand to put it down and when I was "forced" to do so, I couldn't wait until I could pick it back up again. It brought to mind a memory from 2nd grade, when my teacher would select a book & read out loud to us for about 20 minutes each day. It would take a long time to finish reading a story in such short blocks of time (even age appropriate ones,) but I can tell you, it was the favorite part of my day. I was imagining reading 'Spinning Silver' in that fashion and how desperate I would be to get to the storytime part of the day. It's so enthralling (even to an adult) I can almost see how children would be round-eyed with wonder listening to it. I very likely was myself, had I checked a mirror! Besides being a fantastical fairytale, I think it could also be considered a fable?? Right?? There were so many lessons woven into the fabric of the stories. 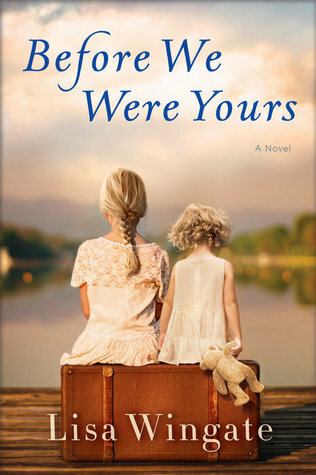 I LOVED that the book revolved primarily around the lives of three young women. All about the same age and each with their own challenges. What was particularly elevating about them, was that none of the girls fell victim to the roles that seemed carved out for them by circumstance of birth. They each took stock of their positions and set out to improve them. They didn't resort to their beauty, tears, playing helpless or seek an easy way out ~ rather they used their brains & cognitive abilities! Outstanding!!! On top of that, they were courageous to boot. 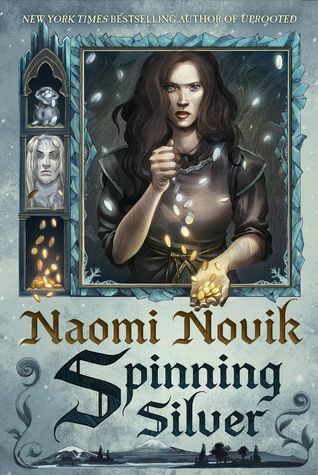 Bravo Naomi Novik, for conjuring role models all females can look up to! They took risks that would sometimes find me holding my breath ~ but then expelling it in the next instant with triumph and/or relief. Miryem, Wanda & Irina's stories start separately but had fascinating intersections. Each builds & unfolds until the "crescendo point" when you realize all three of them are going to converge on the same city & the same house, at the same time. With the connections they've all forged and the goals they had in mind, it was an absolute riveting read to watch them work together to rid themselves of the men mythical creatures that held them "captive." Then after they've done so, to find it was not as satisfying as planned. I thought it was genius to slowly unfurl the various sides of the Winter King & Tsar & teach the reader all is not as first appears ~ another lesson. My feelings evolved about both of them as more and more of their character was revealed. The ending of the book ~ simply 'sigh-worthy.' The Staryk King won more than one heart by the final page ~ he collected all of ours as well. 'Spinning Silver' is one of those books that could have been twice as long had the author wished to expound even further on some of the contents. The little cottage that was in both worlds a perfect example. I found myself wanting to know more about how that was possible & the witch that lived there/built it. Noteworthy to mention: I thought the Jewish culture was beautifully represented. I was surprised by how much it was an integral part of the book. I'm not Jewish but I can appreciate the positive representation especially when (thinking of the recent synagogue shooting) it's a Faith that can't seem to escape persecution. Now that I'm finished, I'm a bit sad I didn't have the discipline to pace myself more slowly. It's always my dilemma ~ getting utterly caught up in a book & racing thru to the ending only to lament not languishing longer in those wonderful worlds when I'm done. Fairytales are a particular weakness of mine but the fairytales I've had the pleasure of reading this year are rich beyond anything I ever read as a child. Naomi Novik truly has a superb gift ~ I hope she has more of these marvelous "yarns" to pluck from her exceptional imagination ~ because I want to keep escaping into their fantastic depths. 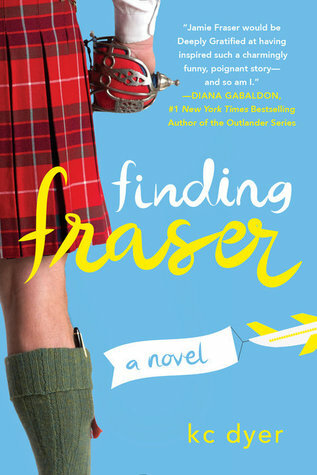 ** spoiler alert ** After finishing up the 'Outlander' series, I ran across this book & added it to my want-to-read list more or less as a lark. I'm definitely a woman (like the protagonist herein) who felt Diana Gabaldon created the ultimate man when she imagined & brought the fictional Jamie Fraser to "life." I remember sighing regretfully, on multiple occasions,that I'd never crossed paths with such a man ~ and I know I wasn't alone with those thoughts. It made complete sense then, that some enterprising writer would capitalize on that popular sentiment & create an adventure in search of a real life version. It felt like a trek I wanted to go on myself!! In that spirit, I started the book with high hopes. Alas, it began a bit slow for me & I had trouble (despite everything aforementioned) with actually liking the protagonist, Emma. She seemed too scatter-brained and not the brightest, especially at making judgement calls whether it be in who to trust, the time of day to visit landmarks, etc. I mean, come on ~ in a foreign country, setting off at dusk (on a bicycle) to explore??? Really?? I had a hard time feeling sorry for her when things "happened" to her along the way. She seemed more like a "green" teenager than an almost 30 year old woman. ** spoiler alert ** Kate Morton is so adept at creating atmosphere and painting rich detail with her gift of language that you know you're in for a treat when you pick up one of her books. She always sets the stage then masterfully unravels the threads in her intriguing, multi-layered stories. 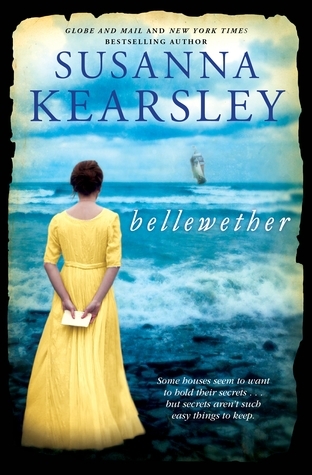 She did it again in 'The Clockmaker's Daughter.' I have so many "dog-eared" pages in my copy because of little tidbits of writing that resonated with me ~ I felt like I should be back in college with a highlighter! There were quite a few characters in the novel, but a non-human one emerged as the dominate presence ~ the house at Birchwood. I could almost see that house (and it's gardens) and reading about it, I could swear, I felt the "pull" of it myself. The theme of a "sense of belonging" within its walls was so compelling. That so many of the characters felt it, in their turn, was interesting. Most weren't related nor did they know anything about the house before almost stumbling across it. Yet they were all drawn in & to it in an inexplicable way. That feeling & concept fascinates me. It's not anything I've experienced personally but I'm inclined (viscerally) to believe in such things. The book started a little slow for me but in its defense, I was also determined to take my time reading it. I wanted to savor the beautiful, evocative writing for as long as possible. As opposed to my normal method of ravenously scarfing up pages after waiting a long time for something new from a favorite author! 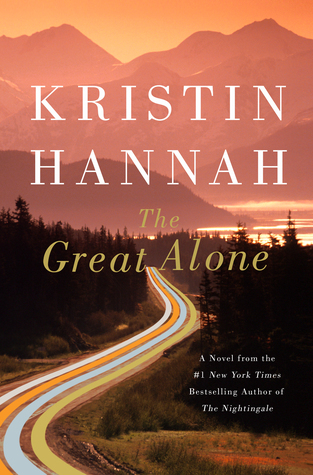 I loved the middle of the book, the build up & the way the pieces started twining together at the end. There were almost too many characters and storylines for me tho and some of them not fully developed (or their storylines weren't??) Maybe Kate was trying to kick it up a notch & triple or quadruple timeline us then it got too overwhelming even for her?? I was NOT a fan of the ending. I don't know why it wasn't satisfying for me that Birdie will never move on from the house?? On some level, I can see the romanticized notion that she's now a part of the fiber of it but mostly I wanted her to be "free" after her story was finally revealed. Free to leave the grounds, free to find Edward, and free from the monotony of waiting on a new and "interesting" visitor. She was, afterall, accidentally trapped there, not there by ownership or particular affiliation with the house. Am I the only one who felt this way? It also seemed a little crazy that Lucy wouldn't remember hiding her away. Maybe I'm not understanding head trauma? aarggg. I kept saying "no, no, no" ~ Kate this can't be the end!! But what ending did I want?? I can't think right now how I could make it better ~ I certainly don't possess a tenth of Ms Morton's skills. I just wanted Birdie to finally be relieved of the mantle of watching over the house & pass on to the next plane?? 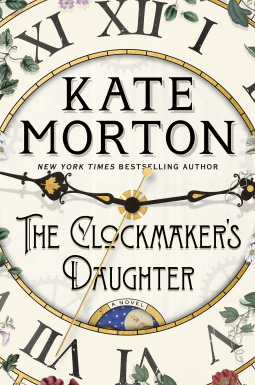 It feels a little odd to give the 'The Clockmaker's Daughter' just 3 stars. I'm so used to absolutely loving everything this author writes. There was a lot to like about it, despite my feelings about how it wrapped but if someone asked me to recommend a Kate Morton book, this one wouldn't displace any of her others in my list of favorites. 'The Forgotten Garden' remains unchallenged at the top. Ok, I "get" what all the fuss was about!! This was a very fun romp thru a world extremely far removed from how the majority of the worlds population lives. I felt like I'd gotten myself immersed in a really good soap opera ~ that I actually wondered how I'd gotten sucked into (??) ~ but somehow I couldn't tear myself away! I definitely want to follow up the book with the movie. 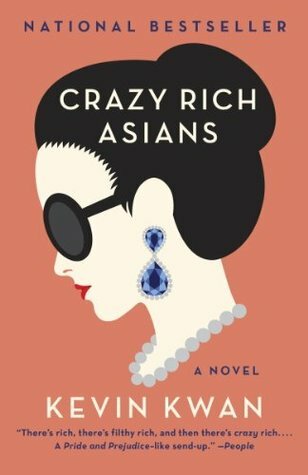 Aside from providing a peek into the lives of the mega rich & all the machinations that occur when money and time are not obstacles, there's nothing particularly redeeming about the book. It's not destined to be classic literature but it's highly entertaining. If you read it with that thought in mind, it will most likely be a very enjoyable diversion from everyday life. 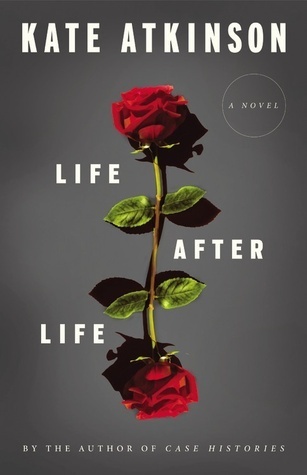 ** spoiler alert ** 'Life After Life' ~ truly a book that makes you to wonder. Which is what I did about it all night. * a manuscript or piece of writing material on which the original writing has been effaced to make room for later writing but of which traces remain. *something reused or altered but still bearing visible traces of its earlier form. The second definition was the most intriguing to me & what Ursula used when she was defining the way time/life worked. Instead of being circular, lives are written and rewritten over top of each other and sometimes the memories from previous or future lives bleed thru. It's the perfect explanation of 'deja vu,' isn't it??? I like the idea of reliving until you "get it right" in some ways but not where you have to do it over and over again with the same set of people. egads. Is mastering the circumstances of each life (with the same cast of people) the only way to move on to a different set of people?? I had never contemplated that before... It's so true that for each choice we make, a completely distinct outcome occurs. I've thought about that a lot with my own life. If only I'd done this, or picked this, etc., etc. ~ then "what would my life look like now?" The book follows Ursula thru a number of lives & switches them so fast you sometimes get confused momentarily. It takes a few lives to catch on about what's happening & for me, almost went on a couple lives too long. The message of the book wouldn't have been lost a hundred pages earlier. There is a lot of history (RE: WWII) that was interesting in the pages tho & along with the concept made for a very thought provoking read. ** spoiler alert ** This book was both fascinating and tedious for me. Fascinating because building something on a scale as immense as the 1893 Chicago Worlds Fair, in a time frame as brief as 27 months, was nothing short of Herculean. Mind blowing actually. The tedious part was subjective. I got more engaged once the Fair actually opened but the first part of the book, with all the planning, the construction, the labor issues, the weather setbacks, etc., drug on for me. The drudgery of those sorts of tasks, albeit essential, just aren't as interesting to me. I kept after it tho because it seemed important to the understanding of what it meant to undertake a project this massive. I'm certainly in awe of Mr. Daniel Burnham (the Director of Works for the whole Fair) to even keep the project as close to schedule as he did and also keep it from completely folding before ever reaching completion. An exceptional feat indeed. Reading about 'The Fair' inspired me to google (as reading often does) pictures of it so that I could see (and put in better context) some of the buildings the author was describing. That brought the book to life for me & I highly recommend doing the same if you're interested in reading it. The black & white photos truly depict a visual wonder. Those huge, (palatial actually) buildings were stunning. The architecture & detail absolutely incredible. The man hours invested ~ off the charts crazy. Deciding to paint everything the same shade of white was genius ~ it made them GLEAM ~ an effect that really shows up in the old black & white photography. It was sickening to learn that almost everything was burnt in a fire at the end of the Fair. I've never been to a World's Fair but in 1893, when most of the population didn't travel, I can see how it would be the most important (or only) exposure a visitor had to other cultures. Touring the buildings/exhibits by other countries and even those of all 44 (at that time) states would be marvelously educational to say nothing of exciting. I was amazed too at all the "big names" that emerged from their contributions/association to the Fair. Thinking about a young Walt Disney watching his father do carpentry work in this magical place had to have been the springboard to his own fairytale vision. So many names that made an impact on history ~ Frank Lloyd Wright & Frederick Olmsted (father of American Landscape Architecture) were two that interested me & even George Ferris, Jr (creator of the Ferris Wheel). The innovations that arose from the pressure to create something more dazzling than the Eiffel Tower, from the previous Worlds Fair in Paris, were astounding. This book was very educational even if I got bogged down in the details. Hats off the Mr Larson for his meticulous research. One would think that everything mentioned heretofore would be enough to constitute a good book. But no, there's actually a second story running alongside the creation of the World's Fair that's equally as compelling and more shocking. That's the one involving serial killer, H.H. Holmes. I had not heard of him prior to reading the book and I almost wish I hadn't still, the guy was so diabolical. I usually shy away from all things associated with murder, they are too frighteningly real to me but strangely, I looked forward to getting to the sections of the book involving Holmes. The murders he carried out were grossly and morbidly riveting. To think of all the lives he took (and exactly how many remains unknown) and how easy it was for him is terrifying. When he was convicted of murder, he was only 34! It was a wide swath of lives he took out for a person of that age. It's so bizarre to think of the brilliant spectacle of the World's Fair going on side by side with the sinister actions of such a psychopath but I guess not surprising. There never seems to be good without evil but Holmes was evil on steroids. Lucky were those who visited and left unaware of & untouched by him. SO much going on in this book. I can't begin to touch on it all. 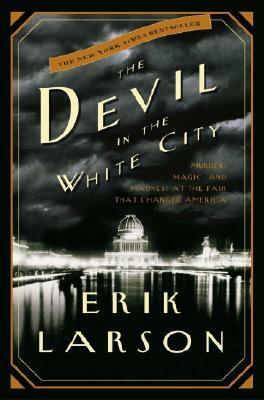 'The Devil in the White City' is really an incredible peek into the history of the era ~ so much more than a recounting of how the Chicago World's Fair was created. I liked it, learned from it and am happy I read it but for a history buff or detail oriented person it would be, hands down, 5 star all the way. ** spoiler alert ** Mount Olympus must have sparked an ember to life and sent it racing across the Atlantic with Madeline Miller's name on it. Her vision of the renowned warrior Achilles life is nothing short of sensational. The reader could easily believe there was something superhuman about the way 'The Song of Achilles' brought him to life and in how readable it is (even if you're someone with no prior exposure to Greek mythology.) This book is as much about his companion/friend/lover, Patroclus, as it is about Achilles. Reading about the two being raised together from boyhood, you understand why the relationship works and just how deeply abiding their love is for each other. There is no jockeying for position or one upsmanship between the two. Each are secure in their strengths and respect for the other. They're also remarkable in their trust of each other but that stems from the very rare trait of complete honesty between them. Patroclus, because of his personality and the devastation of being exiled from his family & country, has an abundance of humility. Although he had some "hero worship" from the first, after he witnessed the unparalleled skill of Achilles for the first time, you understand why Achilles chose him. He never betrayed him, begrudged his prowess, tried to best him, boast about him or lord his position over any of the other boys. He simply accepted him as the magnificent mortal he was and was content in his role by his side. How beautiful is that? I sensed from the time they started sharing a room together (in Achilles fathers palace) that a romantic relationship would develop. The way it happened was so natural, it seemed completely "right." The constant togetherness and how attuned they were to each other ~ it would have been oddly strange if nothing had happened. Even tho I hadn't read any Greek mythology for a long time before recently discovering Madeline Miller, I remembered how Achilles life ended. I still wished for a different ending in the book! Thank goodness the Gods (and Goddesses) have mercy from time to time tho. Thetis showed some at the end when she gave Patroclus a chance for Eternity with her beloved son, despite her scorn/hatred of him in life. I hope Briseis is somewhere near them in the Underworld too. I really liked her and the sweet relationship she shared with Patroclus. 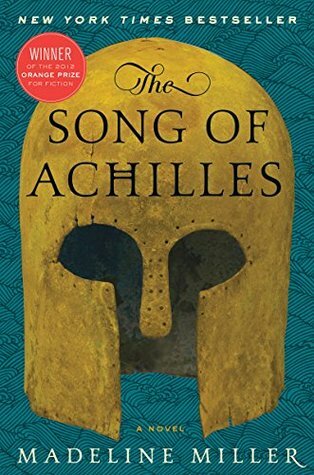 'A Song of Achilles' was beautifully written, well paced and exquisitely developed. A book truly deserving of all the accolades written about it.